The archaeological technique of Pedestrian Survey, also called surface survey or reconnaissance survey, involves walking the surface of an archaeological site or large region in stratified patterns, and either marking the location of identified artifacts, or collecting a sample for further investigation. The field method is an established practice for providing data on settlements in large regions, and is usually considered one part of an investigation strategy. Corridor Surveys and Monitoring determines the possible presence of archaeological remains within a given area. 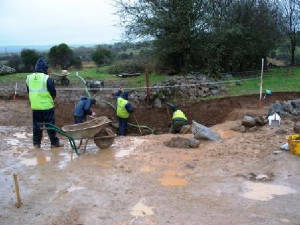 Archaeological Testing, determines the nature and extent of any archaeological remains on site before groundwork commence. Excavation is the time-honoured archaeological tool for understanding the processes of the human past, and it certainly represents the type of activity that most people attribute to archaeology. As a definition, excavation is simply the controlled exploration of what lies below the surface, usually carried out systematically in gridded trenches with shovel and trowel. Through the process of excavation, archaeologists look backwards into time, examining an area at discrete temporal periods. An architectural and building survey is an analysis of different chronological stages and hypothetical theories of a building. A building assessment focuses on a specific building or group of buildings, defining its/their architectural or historic interest, and thereby indicating which elements of a building are more and less sensitive to alteration.